This is a game between two sides that have played each on numerous occasions in European basketball, with the first ever clash taking place over three decades ago. The Greeks hold a 3-7 lead in the last 10 clashes but Milan have been strong at home, winning their two most recent games against the Greens by just two points on both occasions. 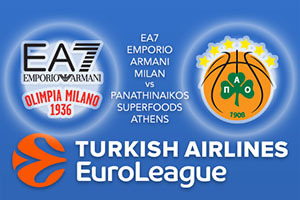 This is a vital Euroleague clash for Milan and they will look back to the end of Round 7 when the two teams were tied on the same record. The Italians have lost every game since then which means that in this game on Wednesday night, they are looking to break a fun of five straight defeats. Confidence will be low for Milan but the fact that they are at home will provide some confidence. Rakim Sanders has been a key player for Milan so far this season, offering an average of 13.5 points per game while Ricky Hickman has offered an average of 10.8 points per game for the Italians to this point of the season. The Greeks will come into this game knowing that they are more defensively sound away from home, giving up an average of 71 points per game than they are at home, offering an average of 82.8 points per game. This means Panathinaikos are usually set up for a strong defensive showing when they play on the road but they still have some players that can do some damage. Nick Calathes has provided an average of 13.3 points per game so far this season while KC Rivers and Chris Singleton have both chipped in with an average of 11.3 points per game. These are the players who will likely make a difference if Panathinaikos are to take anything from this game. You can take Panathinaikos Superfoods Athens at -2, which is provided at odds of 1.90. Anyone looking for the Over/Under market will find that going UNDER 153.5 at odds of 1.90 is likely to be of benefit. Bet Now!